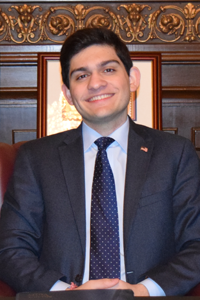 It has been an honor to serve as the 68th Youth Governor of the State of Illinois, and I am truly grateful to have had access to your historic office this year. Being a four-year participant of Youth and Government has been one of the best experiences of my life, giving me confidence in our generation’s ability to advocate. Regardless of where we are from in Illinois, regardless of the polarization that conflicts our government from the local to the federal level, and regardless of race and creed, Youth and Government has allowed dedicated youth to come together and foster the willpower to make a difference in our world. We all have amassed a firm and robust appreciation for government and public policy and its integral influence on our daily lives. It has been a place for unity in a time of profound contention. Being witness to the multifaceted discourse that flowed throughout Youth and Government for the last four years, I have one point of advice. That is, be comfortable with the uncomfortable- expand your comfort zone. I believe that the indispensable knowledge you will garner through these experiences within Youth and Government will allow you to approach the unknown future with confidence, poise, and conviction. You will all become better people: more informed citizens, formed fiercer attitudes, and create a more nuanced outlook on yourselves and your actions, because democracy is an active verb.